The code name of USA's 51st state, a.k.a. Israel's operation that has killed about 400 people (wounded nearly 2000) in Gaza, Palestine since 27 December and even today continually bombing the Gaza strip is called Operation Cast Lead, in reference to a Hanukkah poem by Israeli national poet Hayyim Nahman Bialik. The outrageous murder of human conscience is utterly depressive! The Good God and the Evil God met on the mountain top. The Good God said, "Good day to you, brother." The Evil God made no answer. And the Good God said, "You are in a bad humour today." "Yes," said the Evil God, "for of late I have been often mistaken for you, called by your name, and treated as if I were you, and it ill-pleases me." And the Good God said, "But I too have been mistaken for you and called by your name." The Evil God walked away cursing the stupidity of man. I don't blame you if you ask, what Gaza Strip is because the media is so utterly censored in this country from the major injustices and crime against humanity committed around many parts of the world. Just so you know, Gaza Strip is the world's largest concentration camp created by the state of Israel (some call it the world's largest open air prison). Gaza's reality shows a little glimpse of it. 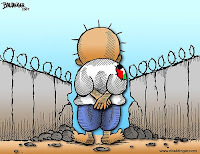 Whats been happening in the Gaza Strip, an occupied territory of Palestine by Israel is really depressing. AFP reported: "There was no space left in the morgue and bodies were piled up in the emergency room and in the corridors, as many of the wounded screamed in pain." 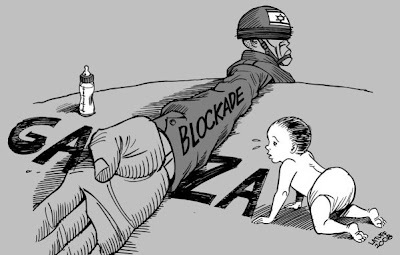 Because of the U.S.-backed Israeli blockade and strangulation of the people of Gaza for the past 18 months there is little or no medicine to treat the wounded, electricity for hospitals, or food or clean water for much of the population. So far close to 400 people are killed and thousands are injured. The medical facilities in Gaza can not cope any more. They have run out of medical supply and a recent boat carrying medical supply to Gaza was rammed by Israel. This is NOT A WAR. A war is a reciprocal military interaction between two parties. This is an indiscriminate attack which has led to the deaths of scores of innocent civilians and particularly children. This is Massacre. Where to know about the real situation? Know the true reality and be a peace maker, policy influencer and policy changer towards peace. And there can be no peace without justice and freedom. Its our human obligation, as part of this human family to know about the suffering caused by injustice, specially when its done by those who we elect to represent us. The weapons sold and gifted to Israel comes from USA and by the money paid by US citizens who has nothing to do with Israel's unjust policy to Palestinians. The least you can do is to know the real truth and do your part to raise awareness and consciousness to stop this madness. It was through mass public awareness and protest that Vietnam war had to stop. Only when majority of American people know the real situation regarding Palestine and Israel, whats happening there for real, only then can they pressurize the US govt. to change their foreign policy and be a true broker of peace and not just an exporter of cluster bombs, F16s and encourager of more and more massacre. There are very few media in the west that reports honestly whats really happening. It is precisely because the same interest group that sells arms and ammunitions around the world, cluster bomb and f-16 and bunker busters are the same interest group that owns the media, runs it and pays for it.
. Al Jazeera English also have their youtube channel. Sheila Musaji writes in her article, Inaction is a Choice: "You can contact your elected officials and tell them that you support the Palestinian right to freedom from occupation, demand and end to the blockade of humanitarian supplies to Gaza, demand International support for a just resolution to the Israeli-Palestinian conflict, demand an immediate end to the violence, demand that the U.S. stop funding military aid to Israel - tell them what you think by going to the Congress.org site putting in your zip code and sending a message." >> Read details Inaction is a Choice. 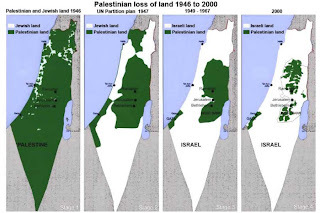 And understand the history of Occupation of Palestine by the creation of Israel and its continuous violation of human rights, watch Occupation 101. Know that there is no peace without justice. You can not treat people inhumanly and rob their human dignity and continuously violate human rights and at the same time talk about peace. Peace talk can not succeed from them who are not peaceful, who are arms dealer and don't understand what peace is. May all wars STOP, may all injustice to all part of the world STOP. May the oppressors perish. Please keep the people of Palestine who are victim of this injustice in your prayers.
. Israel, Stop! Just. Stop. Thou shall not steal. Thou shall not covet your neighbour’s house. How about thou shall not covet your neighbour's land? Well, 'not coveting neighbour's house' actually implies that already I guess.